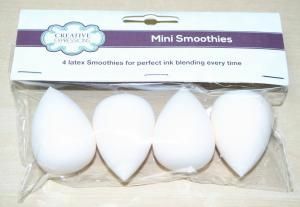 These amazing, ergonomically shaped latex smoothies will revolutionise how you blend inks! Use with ink pads, Cosmic Shimmer Colour Cloud, in fact, any ink product! and you can achieve seemless blending every time! Double ended! Use whichever end is easier for you, it really doesn't make any difference to the end result.. Ink your stamps with them! Blend through dies, masks, stencils etc..
An absolute must have product for anyone who uses inks and ink pads!